Published May 18, 2018 by Addison-Wesley Professional. Part of the LiveLessons series. Two and a half hours of video instruction introducing cloud concepts, the Google Cloud Platform ecosystem, the GCP foundational services, and starting points for implementation. 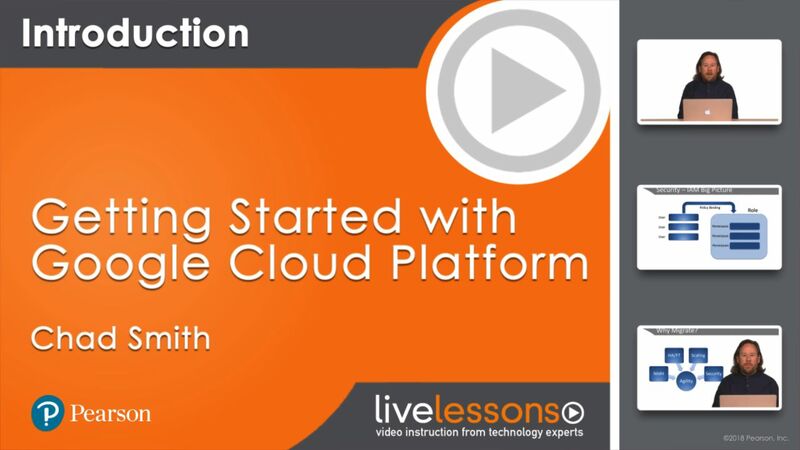 Getting Started with Google Cloud Platform LiveLessons teaches the basics of Google Cloud so you can better understand this key platform. Chad Smith, a Google and AWS certified instructor, designed this course to help you make sense of the choices available in GCP by providing a foundational view of cloud infrastructure, and how it differs from its on-premise counterpart. Through the use of demos and concept walk-throughs, you will learn all about commonly used services and how they integrate with one another and with on-premise infrastructures. Migrating to the cloud can be a journey full of misinformation and assumptions. In addition, the differences between on-premise IT infrastructure and cloud infrastructure make it difficult to understand which services can be appropriate for workloads. Worldwide, cloud-first strategies are being replaced by cloud-only strategies, and for companies who haven’t begun migration, the choices can be overwhelming. In this lesson, you gain a basic understanding of what Cloud Computing means. The differences between traditional IT infrastructure and those deploying into the Cloud are discussed. The path to migration into the Google Cloud is summarized in this lesson. There is a logical progression from simple to complex. This lesson covers the IAM service, and the elements required to set up access control for project resources. The role of monitoring in GCP is discussed, and the service that can be used to deploy a 360-degree monitoring solution of resources both in the cloud and on-premise. This lesson introduces services that can be used for getting work done. Subjects are covered in order of familiarity compared to traditional data centers, leading with compute services, and then network services. The application-hosting services in GCP are explored in this lesson. There is a range of options, from 100% flexible to 100% managed, spanning several services and features. This lesson has implications on architecture, devops, and operations, as well as the tradeoffs between the three. In this lesson some of the best practices that Google has learned by hosting such a large infrastructure are discussed, focusing on operations. Automation in GCP is covered, and the lesson ends with a discussion on the role of QA in a well-run, cloud-based environment. There is so much more to the GCP ecosystem that targets specific workloads and use cases, and these services and features span many different disciplines. For customers who are just starting out, there are resources to assist with migration and experimentation. These can be essential to a successful adoption of GCP; as such, some guidance on next steps is provided.